MPLAB® Harmony is a flexible firmware development platform for PIC32 microcontrollers. This integrated software framework provides driver libraries and APIs that make it easier for you to use PIC32 peripherals (Timers, GPIO, UART, I2C, SPI, etc.). It also includes middleware libraries for USB (Host and Device), TCP/IP (Ethernet and Wi-Fi®), Graphics, Bluetooth, and others. This tutorial shows you how to use the MPLAB Harmony Configurator (MHC) to create a USB speaker application running on the PIC32 Multimedia Expansion Board II (MEB II). You will also learn how to use the MPLAB Harmony Graphics Composer (MHGC) to create a touch-controlled display to control the USB speaker. Use (MHC) to configure the audio CODEC on the PIC32 Multimedia Expansion Board II. Demonstrate the use of Harmony Framework libraries to use the USB middleware and Graphics Library. USB Type A male to micro-B male cable for USB audio speaker functionality. 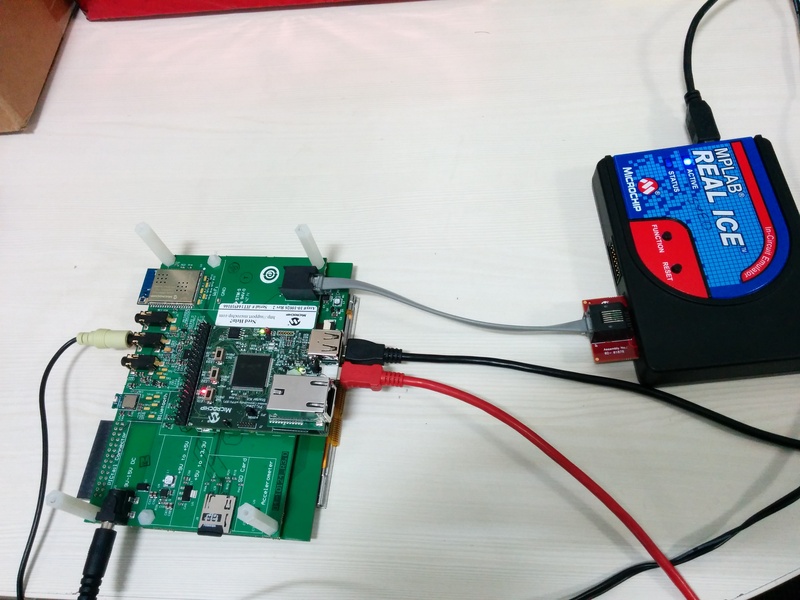 This lab enables the MEB II Board to act as a USB speaker by playing audio data (sampling rate: 48kHz, 16-bit data), streamed by the USB host (typically a PC). This is done by adding a CODEC driver and the USB audio device library to the project. Figure 1.1 shows the application tasks. 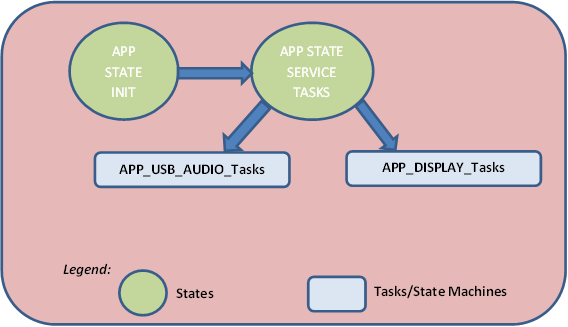 The APP_USB_AUDIO_Tasks function handles USB audio application related states and events. The APP_DISPLAY_Tasks function manages volume changes and mute/un-mute requests from the GUI. 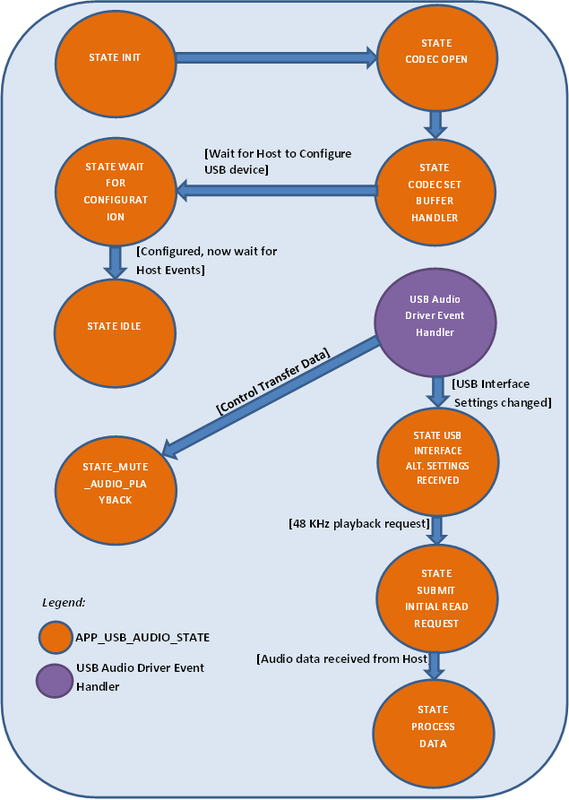 The USB audio state machine (as shown in Figure 1.2) first opens the USB Device driver and registers a Device event handler to receive Device layer USB events. The state machine then opens the audio CODEC and registers a buffer event handler. It then waits for the USB host to configure the Device. After the Device is configured, the state machine enters an idle loop waiting for USB host events. When the user opens an audio player application on the PC (USB host), the device receives (alternate) interface settings through the USB audio driver event handler. If the Device is capable of servicing the new settings, the state machine then requests the host to send a stream of audio data. Once the device receives the audio stream, it enters the process data state where it submits the received audio data to the CODEC driver for playing, and requests more data from the USB host. The cycle then repeats. If this is not done, MPLAB X IDE will not be able to find all source files for the lab solution (see the project in the firmware folder) and the solution project will not build successfully. usb_speaker_lab contains the lab solution (in the firmware folder) and source files (in the dev_files folder).